It wasn’t hard to find the place to take off my shoes for this post. On Saturday our Mum was taken to hospital with a stroke. Mum lives alone, independent by choice, but through a wondrous chain of events one son was there when it happened and was able to immediately get her an ambulance. She was at the hospital, through the CT scan that revealed a clot in her brain, and being given the clot-busting treatment before the hour was up. She has made a remarkable recovery and will make more, but it is a very hard road to have to walk in the oldest stage of life. A stroke is such an aptly named event. Even though Mum had a medical condition and took medication that still left her at risk, when it occurred it was in the space of time that a downward chopping stroke of your hand might take. Plans and certainties rudely proved in that moment to be illusions, as she fell to the floor immobilised and speechless and not comprehending what had happened to her. We, all her sons and daughters, were confronted by the precarious of existence – hers and ultimately also our own. It was so good to be able to all be there together, sharing the fears, talking over our responsibilities, watching out for each other, loving each other. We shared the surge of joy and relief when she emerged from the theatre alive and with us still. 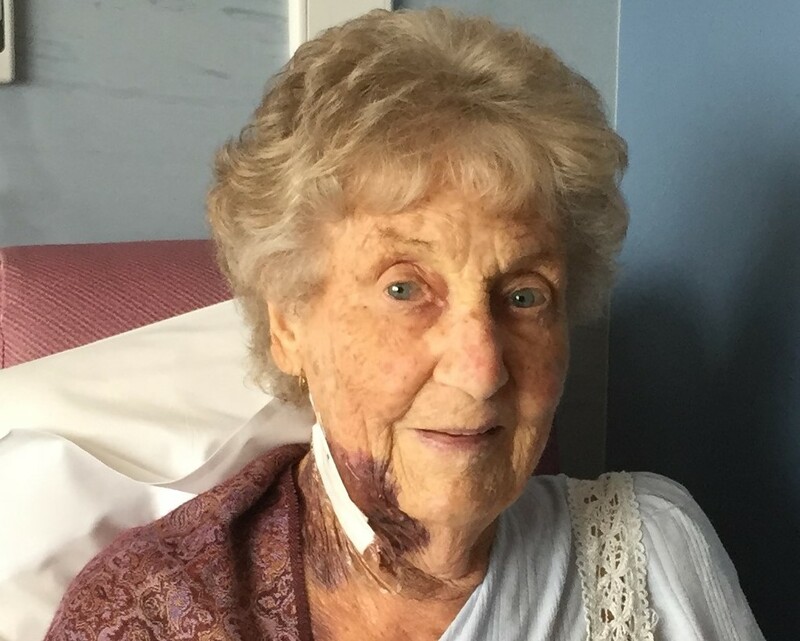 As Mum has regained speech, movement and brain function (yesterday, 5 days post-stroke, she was back on to the crosswords and soduku) we have all talked about living in such a privileged part of the world, and in this advanced stage of technology. So many factors came together to allow her such a good outcome that has not been the case for others we know and love. Mum has always been a very fit and positive person and was blessed with a strong constitution. She worked in every way she could to make her body strong and for it to be able to support the busy life she has led. She is probably one of the fittest 91 year olds to pass through the hospital ward. This does not take away her grief at losing the reality that was hers before that second. She is shocked and sad, exhausted and apprehensive, as well as rebuilding hope and making her choices about what she wants. With her usual courage she is facing working out the dimensions of what has happened and what the implications are for her. She is surrounded by love and the most superb care, from the ambos and doctors, the surgeon who removed the clots for half an hour, the nurses and therapists, who attended to her with skill and gentleness (and to all of us with patience), to the cleaners and food deliverers and volunteers who quietly attended to her needs, to her Parish Priest and friend who came that very night with the sacraments that fed Mum’s faith and trust. The love and concern for other people that Mum has lived by, has been overwhelmingly returned. So many people want to care for her that we have to go by roster so her brain has a chance to have the rest it needs to reweave itself. Her personal friends have kept her in their hearts and prayers, understanding that staying away is the gift that they can give for the present. They will soon be able to come and help her talk her way through this massive disruption, and be there for her after it. You can be sure that as Mum sets off today to the Rehab facility, she will be at those exercises and tasks that lead her back to independence – and if all the love she has received could become a physical manifestation, she would be carried so high she would fly. This entry was posted in faith, family, grace, hope, life, seasons, together. Bookmark the permalink. 3 Responses to The Gritty Side of Love. Grit and grace for you all on the journey ahead. Wishing your mother a speedy recovery . Lovely that she has been able to experience the love and support of many while still here. Sorry I have been unavailable for you Audrey but I know you will be well looked after by your family and friends. See you soon.